What words in literature inspire greater visions of beauty than Christopher Marlowe’s description of Helen of Troy, “the face that launched a thousand ships”? These words embrace a concept of beauty that is both irrefutably desirable yet undeniably destructive. History abounds with the stories of beautiful women many of whom have been cautiously portrayed as dubious and guileful. Helen of Troy, Cleopatra, Nefertiti and Aphrodite (to name a few) all occupy a controversial if nebulous place in history. To this date legends of their beauty abound and enthrall human mind. If these women represent the concept of ancient beauty what does the archetypal face of beauty look like? The most telling archeological evidence of ancient beauty would have to be the bust of Nefertiti the wife of Egyptian Pharaoh Akhenaten. Nefertiti is depicted as a woman with a long face, chiseled features and most notably; a swan like long neck. The subtle wrinkles under her eyes may be indicative of her vision and maturity. So famous was Nefertiti during the reign of her husband Akhenaten that she appears twice as much as the Pharaoh himself in works of art. In fact her status over the years of Akhenaten’s rule becomes parallel to that of the king himself. 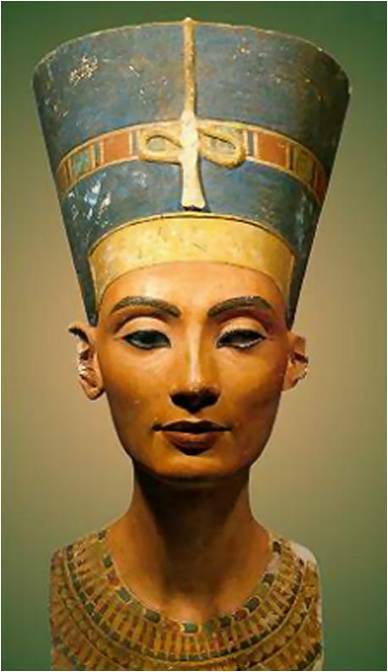 In sharp contrast to the depiction of Nefertiti is that of Cleopatra (who by the way was a Macedonian Greek not Egyptian). Although she is depicted in literature as woman of unsurpassable beauty, images of Cleopatra in ancient coins present a different picture altogether. Some coins depict her as a woman of average beauty while others show her with a hooked nose and almost man like features all complete with an Adam’s apple. How then does she attract two of the greatest men, Julius Caesar and Mark Antony? Although the depiction of Cleopatra in coins may have been politically inspired to present the picture of a powerful queen, Plutarch the Greek historian credits Cleopatra’s secret to be her vivacious personality and wit rather than physical beauty. Cleopatra is one of the most celebrated figures of history yet so much of her story is subject to speculation; from her seduction of Julius Caesar and Mark Antony to her death. In complete departure from Cleopatra and Nefertiti are the legendary characters; Helen of Troy and Aphrodite the Greek goddess of beauty. While the former two are flesh and blood women of power and ambition the latter two are a figment of human imagination and one wonders; if an active male one at that? Helen of Troy was said to have been the most beautiful woman in the world, whose adulterous affair with Paris, caused the 10 year long Trojan War. According to some accounts she willingly leaves with Paris for Troy leaving behind her faithful husband, daughter and parents. Sadly, Homer talks little of her and merely describes her as the “white armed, long robed and richly tressed” woman. She is cloaked in a shroud of mystery and never really vindicated as she never repents or repays for her sin of causing a war and countless deaths. She survives the wrath of Menelaus her estranged husband solely on account of her beauty and guile. I wonder if her character is a realistic portrayal of a woman or deliberately left dubious and incredible? Aphrodite the Goddess of love also renowned for her long, golden hair and voluptuous body, plays the unyielding role of a seductress in the Greek mythology having many affairs outside her marriage. She uses her godly powers to cause the love affair between Helen and Paris. Aphrodite is depicted as the archetype of beauty, love and fertility and above all a temptress. One thing that stands out in common between these women beside their beauty and wit is that somehow time and history has favored their character to be sewn in the very fabric of mystery and intrigue. These are the beautiful yet imperfect faces of women that above all shall not be ignored. Many years ago, on a road trip,we found ourselves in Santa Rosa where The Rosacrucians were having an Egyptian exhibit. We went. Near the entrance stood a guard in front of a railed off space, behind which sat a bust of Nefertiti which, we assumed, was a replica. Not so. It was the original, borrowed from a museum in Germany. Words fail to describe the feeling of awe. One could sense all the centuries, all the beauty,all the history that enveloped her. It was the most thrilling art I have ever seen. WOW, thanks for sharing that story. Its definitely my dream to see the bust of Nefertiti. I believe it is currently in the Egyptian Museum of Berlin. Loved your perspective of beauty and the various synonyms that go with it………synonyms ironically, that do not mean beauty in the real sense of the word!. Thank you for your equally insightful comment. Yes, looking down at the Niagara falls is a very overwhelming experience. Personally I am infatuated with all cultures, History and mythology of all places excite me.